Filed to: Pokemon Lets Go!Filed to: Pokemon Lets Go! It’s Pokémon Let’s Go launch day, and trainers around the world are setting off on a new adventure through Kanto with their partner Pokémon. That is, unless they can’t decide between the Eevee and Pikachu versions of the game. We’re here to help. You should definitely choose Eevee. Or maybe Pikachu. Ultimately, the decision comes down to personal preference. 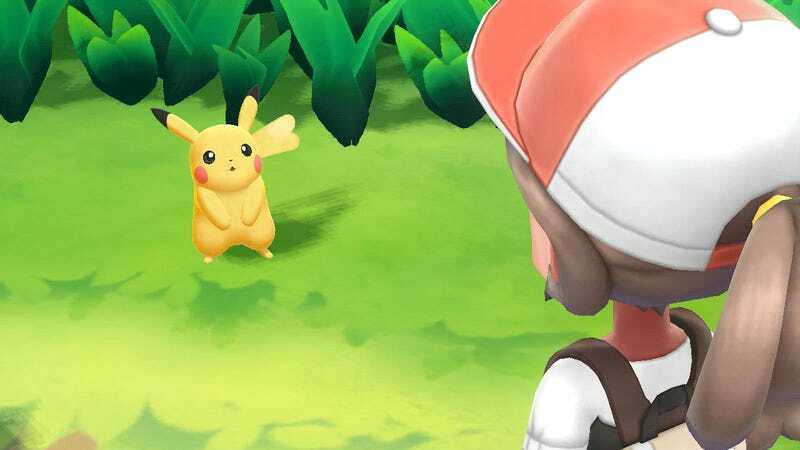 While the Pokémon Let’s Go games are remakes of the original Pokémon games, they are far from traditional entries in the series. These are games built for a post Pokémon Go world, where anyone anywhere can catch pocket monsters as long as they have a compatible mobile device. And once caught, those monsters can be transferred to the Nintendo Switch version of their choosing. So right away we eliminate one of the major reasons to choose between different Pokémon game versions—exclusive Pokémon. In older games if, say, Sandshrew were only available in one version, players would have to trade online or in person for one. Now all they need to do is catch one in Pokémon Go and transfer it over. So don’t worry too much about the list of exclusive Pokemon below if you have access to Pokémon Go. If you do not, however, then carefully consider the two lists and see if there’s a pocket monster you absolutely cannot live without. If I didn’t have the mobile game handy, I might have gone with Pikachu, because I cannot live without Sandshrew and cannot be bothered to trade with people. With exclusive Pokémon not being that important, the biggest factor in the decision is which of the two partners you prefer. If it’s Eevee, then you’re a good person deserving of respect and love. If it’s Pikachu, then you could be a monster, I really couldn’t say. Look how happy the Eevee player is. See how unsure about life the Pikachu player is. Only kidding. I love all of you Poképeople equally, no matter what horrible mistakes you might make. And there are plenty of reasons to chose Pikachu over Eevee. For one, you get to spend the entire game listening to the dulcet tones of Ikue Ōtani, the voice of Pikachu. Every “pika pi” from the electric mouse’s mouth is ridiculously adorable. And since Pikachu has been such a star in the animation, its version feels more official. That said, we’ve had Pikachu following us around a game before. The little zaprat had his own game in Pokémon Yellow. We need some new blood. We need Eevee. Eevee is ridiculously cute, especially when wearing a hat and glasses. Its voice, while not quite as iconic as Pikachu’s, is light and charming. Voice actress Aoi Yūki was also the voice of Pascal in Nier Automata, along with countless other anime and video game roles. As an added plus, if your Eevee turns out to be a female (there is a chance of either when the game starts), she’ll have a heart shape on the tip of her tail. How cute! A lot of this is personal preference, as many normal deciding factors between the two pocket monsters are null and void. Neither of the partner Pokémon evolve—they simply refuse. If you want a Raichu or a Vaporeon, you’ll have to catch an extra Pikachu or Eevee. And both of them appear in catchable form in each other’s game, so it’s not like in choosing one you miss out on the other. Both partner Pokémon are extraordinary examples of their species, capable of learning special moves no other Pikachu or Eevee can. By the end of the game, both wind up being ridiculously powerful mutant pocket monsters, far stronger than normal. Both gain access to special partner moves, powerful elemental attacks that cause status effects on opponents. Pikachu can learn three (Zippy Zap, Fally Fall, Splishy Splash), while Eevee can learn five (Sizzly Slide, Buzzy Buzz, Bouncy Bubble, Darky Dark and Glitzy Glow). The powers each Pokémon winds up with towards the end of the game depends on the player, so how useful these extra moves are is up to the trainer. If abilities aren’t a factor and exclusive Pokémon aren’t important, it all comes down to which of the two you like better. Who do you want to see in cutscenes? Pikachu? Shoulder or head? Electric or normal? Evil or good? (Maybe not that last one.) Just pick the one you love the most. Find someone else with the game and let the two fight to the death. Or flip a coin. They’re both good games, Brent. Second verse, same as the first but a bit more electric and a little bit worse.